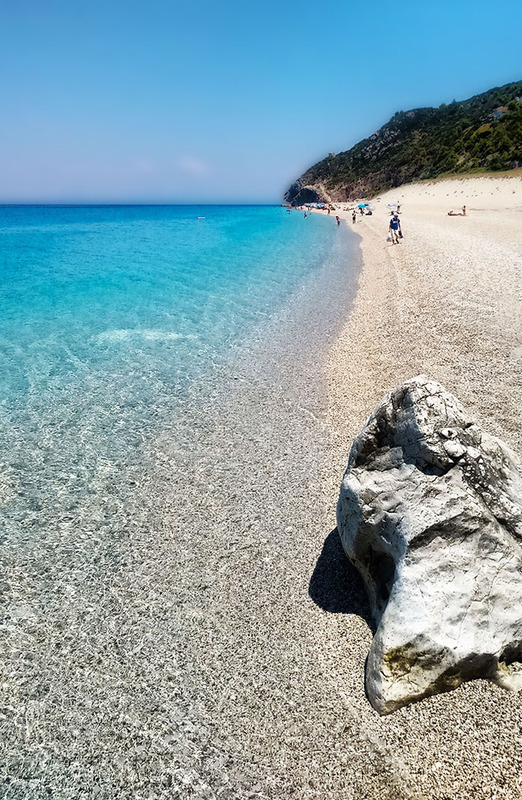 I love the see and I miss it so much….Thus we (I and my husband) choose again a little greek Island for our summer vacation this year; we were sure to find exactly what we wanted in Lefkada: sun shining, wonderful sea and beaches. Have you ever heard about Lefkada? if not, I would recommend you to go farther in reading: perhaps you will be convinced in choosing this island as your next holidays destination ☺. 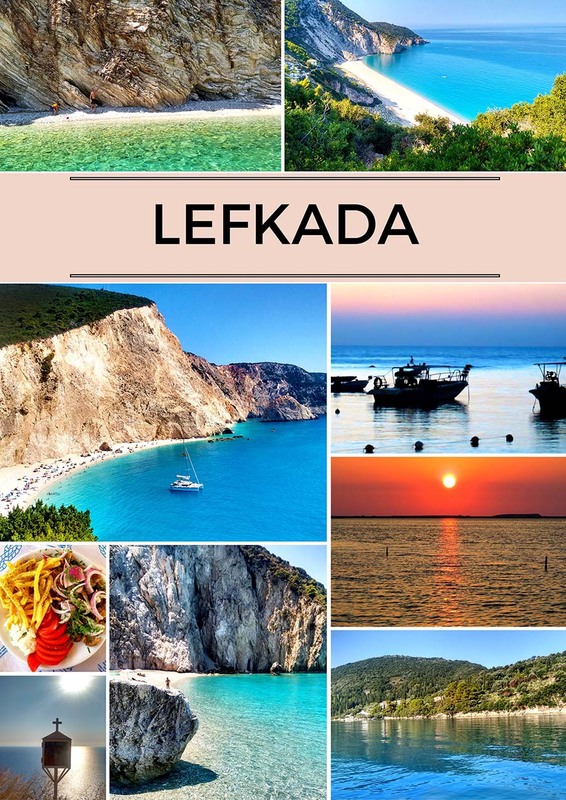 If you're planning a trip to Lefkada, I hope my quick experience post will help and give you other ideas and inspiration for your travel organization. Belonging to an archipelago in front of the western greek coast, Lefkada offers amazing seascapes, with turquoise water and clear pebbly beaches that are surrounded by an unspoiled mountain backdrop. This little island, characterized by a wild beauty and a quiet atmosphere, is perfect for families and couples. from top left: Limni beach | Milos beach | Porto Katsiki | twilight in Agios Kikitas | sunset view from Lefkada town | delicious gyros from Greek cuisine | Milos beach turquoise water | Meganisi Island channel | Pefkoulia cross from panoramic road "Epar.Od. Lefkas - Kato Exanthias"
night life, from what I have heard, concentrates around Nidry, a small village on the eastern side. We booked an apartment about 2 km far from Agios Nikitas, the principal village in the north-western coast of Lefkada. Our priority was to reach the nice beaches on that side as fast as possible, every day, in the morning and in the afternoon, and also to find easily markets and restaurants around. From the location of our flat we could reach Lefkada town in half an hour, but Nydri was really too far: 50 minutes to arrive there. Anyway, we were very satisfied with our apartment choise: it was confortable for our vacation style and movements, that included all mornings at the sea, the lunch in a cozy tavern in Agios Nikitas almost every day, relaxing in our flat during the hottest hours, going back to the sea in the afternoon and sometime a dinner in the pleasant Lefkada town. From the terrace of our flat, located on the top of a hill, we had also the possibility to admire wonderful panoramas and sunsets on the sea, and this added a lot of value to our vacation, because, when we didn’t want to go out, we could have our breakfasts, lunches or dinners directly there, and at the same time enjoy the amazing view. A really well-known place where to eat, famous for its spectacular location, is Rachi. It is located next to a small village named Exanthia on the top of a mountain, about 10 km far from Agios Nikitas, going towards the south of Lefkada. 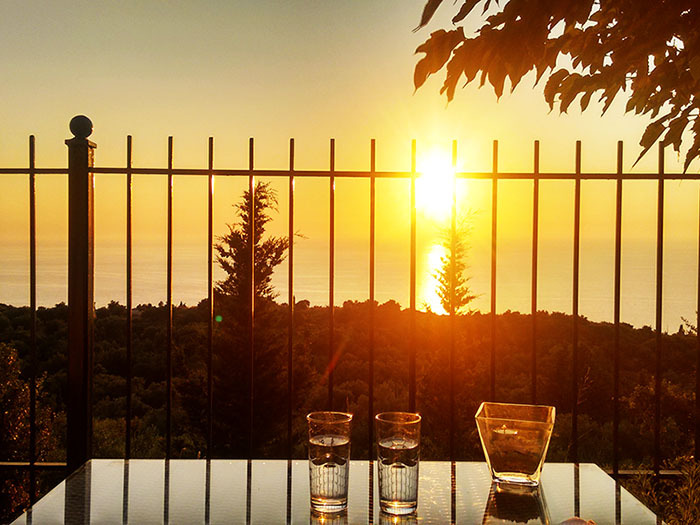 We were advised to have a dinner there, as it is possible to appreciate the taste of typical greek recipes in front of the sea lit by the amazing orange light of the sunset. The panorama from that point is so impressive that people come to Rachi only to take some pictures capturing those splendid sceneries. But…oh my gosh… if you call Rachi to make a table reservation they answer you that this service is not available. So we reached that wonderful restaurant, and… unfortunately there were no places where to sit and a long queue. We were told to wait an hour and of course we decided to choose another place for our dinner. We started going random and were lucky because we almost immediately found out another nice restaurant, with a fantastic view, where the food was great. At the end of our vacation we realized that on the north-western coast of Lefkada, from Kalamitsi to Pefkoulia, going throught Kathisma beach and Agios Nikitas there are a lot of great restaurants, bars and pubs. We visited the most famous beaches in the western island coast. the ones equipped with sun beds and umbrellas, near kiosks and bars where to buy food, drinks and listen to music. the ones with no services at all, where the nature is marvellously untouched, and that are sometime difficult to reach. the young Kathisma beach, ideal for people loving acquatic sports and really appreciated by young people, as it is possible to find there a good selection of trendy bars in front of the sea. the little Agios Nikitas bay, from where you can walk on foot directly to a typical restaurant near the center of the namesake village. the small Kavalikefta rock cove, at the base of a mountain. the faboulous Egremni beach with such an amazing turquoise water, unfortunately now accessible only by sea, due to the earthquake happened in november 2015. I was satisfied for have visited these nice places. I only regret that I couldn't reach this wonderful Egremni location. Anyway, I have also to say that I am the kind of person searching for quite beaches, not so crowded, possibly without services, because my desire is to feel the environment around me, meditate, stop my mind thinking. This is really the way that helps me to forget the work, the noisy city where i use to spend my days, everything. From my experience in Lefkada, long beaches, like Kathisma, Pefkoulia or Milos beach, always have a final part, far from their entrance points ( and then not easy to reach! ), where it is possible to meet only a few persons; generally they are couples and/or nudists. If you are interested in such places, you need only to walk a little bit more then normal…and then you will enjoy the amazing atmosphere of the impressive nature around you. And what about Lefkada town? We spent really good moments there. I absolutely recommend you to have an aperitif served in one of the nice and fashionable bars located in the Lefkada seafront, waiting for the evening, watching the sun falling down. You can also walk along the main tourist street of Lefkada and be captured by the wonderful bright colours of the craft and souvenir shops that populate the avenues around. And if you get lost in the alleys of the village, don’t worry! You will be surprised to discover lovely secret corners hiding cozy restaurants. Book a cruise to have a daily journey among the nice small islands on the eastern side of Lefkada. Generally you find many boats offering trips from Nydri with various itineraries, but to escape the crowds it's better to consider tours organized in sailing boats, like we have done. 7 days were not enough to explore all the beautiful places of Lefkada: I would have visited other beaches on the east part of this island, like Poros, and stop over the Nydri’s waterfalls. Hi, Lilah, I'm Valentina. I looked forward to the day you would have done your blog! I've seen everything you posted and also your creations, and I had no idea you was so genious! I didn't imagine you would have combined the passion for photography to your creative work here! Oh boys, I'm speechless: you can make jewels, a lot of different creations and such amazing photos! I like these colours so vivid and captivating. Well, now I hope that you write other posts as soon as possible, because I want more. So you have to write here like there's no tomorrow! Dear Valentina, thank you so much for your nice words and your support. Yes, finally, I set up this blog so that I can share all my creative works and travel experiences in one place. I've already started to write other posts that I hope to publish as soon as possible. Cheers! See you soon!! I cannot wait to know what you are planning to do, therefore you post soon something, because I'm curious!